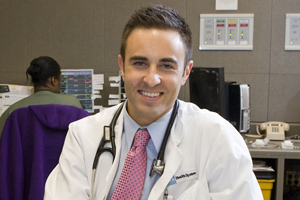 Background: Justin Laube, MD, received his medical degree from the University of Minnesota’s medical school in 2011. He is originally from St. Louis Park, Minn. He is currently in the primary care track internship in the department of internal medicine at the UCLA Health System. Please give us a brief rundown of your experience using Epic. I have been using Epic since the beginning of my clinical rotations during medical school. I received additional training to become an Epic super user and helped with the monthlong Epic implementation at the University of Minnesota Medical Center, Fairview. I worked primarily with physicians and nurse practitioners who were new to Epic, and helped them get comfortable with incorporating Epic into their daily practice. I have additional training in Beacon, the Epic application for hematology/oncology. What do you like best about the Epic system? It provides a fully integrated, centralized, and organized medical record that fosters more efficient, safe, and effective care. Do you miss using Epic since we don’t have it at UCLA? Absolutely – having multiple fragmented systems is really inefficient. Essentris functionalities are similar to those of Epic, but it is a separate system so ancillary staff notes are more difficult to find and you cannot populate your notes with vitals data. CView is unreliable and slow, but does have some of the same basic features of documentation sorting that Epic does. Paper ordering is just not ideal for providing safe medical prescribing, and it is highly inefficient when having to drop orders off. How do you expect CareConnect will be better than the systems currently in place at UCLA? CareConnect will dramatically improve multiple aspects of medical care at UCLA. For example, Epic’s safeguards and drug interaction guidance helps reduce errors in electronic ordering. The system will also reduce verbal ordering and prevent teams and providers from having to run around to multiple floors to place orders. The process of obtaining all necessary vitals, labs, documents, and advanced directives can be done in one streamlined system, which makes pre-rounding and consulting much simpler and more efficient. Furthermore, through the use of SmartPhrases and SmartTexts, users will have the ability to load the labs, vitals, and exam templates with a few clicks or a few keys -- greatly improving efficiency of documentation. Notes will now only be in electronic form so now you can easily read what a specialist note says. These are only a few examples of the benefits CareConnect will provide. What can we do to make sure we're ready? Make sure the notes templates are concise and easy to use. Residents are some of the most intimately involved EHR users in the hospital, so be sure to involve them in every step of the process. They will be at the front line during go-live to help with issues and offer ideas to improve the system. What do you think will be the most challenging part of implementing CareConnect? Working with physicians and staff who have been using their current system (electronic or paper chart) for the longest will be most challenging. The change will initially slow down efficiency, but over time it will make great improvements. Epic can be slightly overwhelming and complicated for more novice computer users, but it will just take time for everyone to become comfortable with the new EHR. What advice would you give to your colleagues at UCLA about CareConnect? Get active in the process of this transition. Epic is not a pre-made system that is the same for every institution. It is a highly modifiable program that is built for each institution. So even during go-live there are changes being made in real-time to documentation templates, order sets, many other aspects. So if you get frustrated during the go-live, it’s likely there will be a way to improve it.